Google has worked to make Android apps feel at home on Chrome OS, and we've certainly come a long way. Your apps will be even more integrated soon with support for app shortcuts on the Chrome OS desktop. This feature is only in the dev channel right now, but it should eventually filter down to beta and stable. The "app shortcuts" about which we're talking are what used to be called "launcher shortcuts" during the N developer preview. These are shortcuts to useful and recommended app features that appear when you long-press the icons. Now, you can do the same thing with your Android apps on Chrome OS. To try this feature, make sure you're on the dev channel. Then, go to chrome://flags/#enable-touchable-app-context-menu to enable app shortcuts. Currently, app shortcuts only appear for Android apps that are pinned to your Shelf at the bottom of the screen. 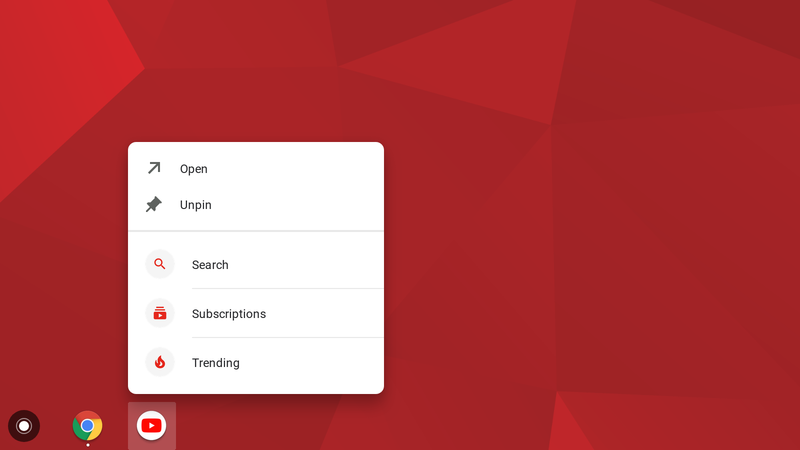 However, you can't drag the shortcuts out to pin them on Chrome OS like you can on Android.